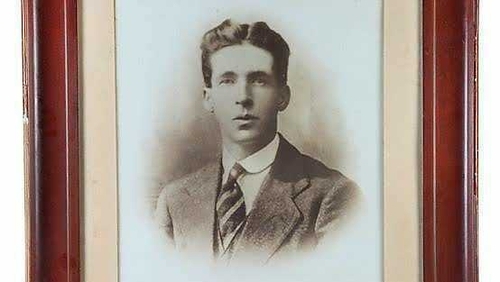 The family of a Cork man who died on hunger strike 99 years ago have said they are thrilled that he is to be awarded a posthumous medal. Joe Murphy died at the age of 25 in Cork Gaol on 25 October 1920 following 76 days on hunger strike. However, his death came just hours after that of the Lord Mayor of Cork, Terence MacSwiney, in Brixton Prison and was overshadowed by it. Murphy had been arrested in July 1920 for possession of a bomb and was held in Cork Gaol. During this time, IRA prisoners had their political status removed, leading to a mass hunger strike. The Government has now announced he will be awarded a 1917-1921 official service medal in recognition of his role in the fight for independence. Speaking on RTÉ's News at One, Murphy's grand-niece Shirley Kelleher said her father got emotional when they got the news. Ms Kelleher said her father had been fighting "all his life" to get recognition for the role his uncle played in the War of Independence. She added that while MacSwiney got much of the publicity, Joe Murphy has been remembered in his native area of Pouladuff in Cork. An expert in the War of Independence has said that as we move through the centenary commerative process for the War of Independence, "lesser-known figures who are no less compelling come into the frame". Speaking on the same programme, Dr John Borgonovo from the School of History at UCC said there are "layers and layers and layers" to the narrative of the struggle for independence. He said the international media lens was focused on MacSwiney as his predecessor as Lord Mayor of Cork, Tomás MacCurtain, had been assassinated by the RIC. Tomorrow is the 99th anniversary of his death. "The assassination of MacCurtain had been international news and his successor then is on hunger strike and that becomes an even bigger story," Dr Borgonovo said. "In a way, all the attention went to MacSwiney in Brixton Pison in London where he had been deported while his colleagues in Cork men's prison remained on hunger strike."